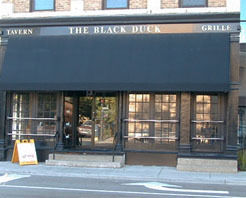 BLACK DUCK TAVERN & GRILLE is perhaps best known for the restaurant side, which serves up incredible sandwiches and steaks, which you can enjoy on their patio in the warmer months. They're also known for their eighteen dollar menu, which include the salad, the entree, the sides, and a dessert. Of course you're here to hear about the bar, and it is definitely one of our favorites. Many of their best drinks are less than five bucks, one of which is a vodka lemonade concoction that we can't get enough of. Their selection of beer, wines, and micro brews is to be commended. Great place to quench your thirst and relax with a cold one!